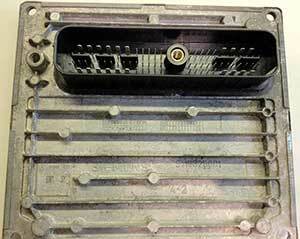 This ECU failed the customer spontaneously whilst driving. The customer reported the car was driving find when all of a sudden he lost power, when he switched the vehicle off and tried to restart, the engine it would not start. Eventually they managed to start the engine but it was running rough and only firing on two cylinders. The customer sent the ECU in for our ECU Testing + Repair services. We tested the ECU and found a fault in the Micro processor unit. We replaced the Micro chip and reflashed the ECU with new software and retested the ECU. The ECU passed second time on our testing bench and was returned to the customer fully functional with a 12 month warranty. This Petrol Ford Fiesta 1.25L is fitted with a Siemens SIM210 Engine ECU. If you have a Ford with an ECU fault, get in touch today for an instant quote. You can email us, drop in or call 0208 853 5000. This entry was posted in Repaired ECU's and tagged 4S6112A650EB, Ford Fiesta ECU Faults, Ford Fiesta ECU Problems, Ford Fiesta ECU Repairs by smartAjaz. Bookmark the permalink.